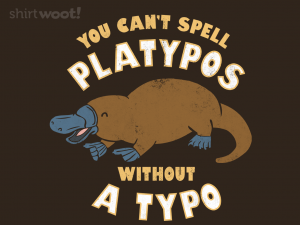 Who Gave the Platypus a Keyboard? Look at the smug little grin on this platypus’s face. He knows he made a horrible joke and he’s proud of it. Who is responsible for this platypus? Someone come claim their half-duck-half-beaver thing before it gets on stage in front of a brick wall and starts dropping bombs. This animal belongs in a zoo, not a T-shirt where its jokes can be immortalized. *sigh* … okay, fine, I laughed. I guess it’s kinda funny. So, yeah, go ahead and wrap this cloth around your torso if like to laugh at terrible jokes.